Audiences were in a rebellious mood, lifting the action tale "V for Vendetta" to the top spot at the weekend box office with a $26.1 million debut. The Warner Bros. film, which stars Natalie Portman and Hugo Weaving in a story of revolution against a totalitarian British government, bumped off the previous weekend's box-office leaders. Paramount's romantic comedy "Failure to Launch," which debuted at No. 1, slipped to second place with $15.8 million, raising its 10-day domestic total to $48.5 million, according to studio estimates Sunday. Disney's family remake "The Shaggy Dog," which premiered at No. 2, fell to third with $13.6 million, lifting its 10-day total to $35.9 million. This weekend's other new wide release, Paramount's "She's the Man," opened in fourth with $11 million. The romance stars Amanda Bynes as a teen disguising herself as a male to play on a boys' soccer team in a modern update of Shakespeare's "Twelfth Night." "Even though I was dressed as a man, I still looked like a girl dressed up as a man. That's sort of the joke," Byrnes said on CBS News' The Early Show. Fox Searchlight's tobacco-industry satire "Thank You for Smoking" opened to huge numbers in limited release, grossing $260,066 at five theaters for a whopping $52,013 average a cinema. 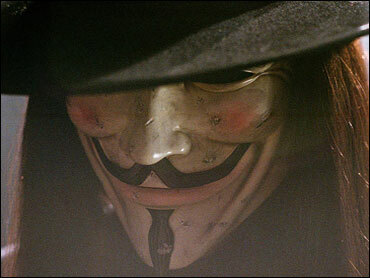 By comparison, "V for Vendetta" averaged $7,767 in 3,365 theaters. Starring Aaron Eckhart as a spin doctor for cigarette companies, "Thank You for Smoking" gradually expands into nationwide release through April 7. The film was directed by Jason Reitman, son of filmmaker Ivan Reitman ("Ghostbusters"). Overall box office revenue continued a month-long decline, with the top-12 movies taking in $93.8 million, down 11 percent from the same weekend last year, when "The Ring Two" opened with $35.1 million. "V for Vendetta" was adapted by Andy and Larry Wachowski, creators of "The Matrix" franchise, from a graphic novel about a masked freedom fighter battling British fascism in the near future. The film was produced by Joel Silver, who also made "The Matrix" flicks, and directed by James McTeigue, a protege of the Wachowski brothers. Critics generally gave thumbs up to "V for Vendetta," calling it a smarter-than-average, visually impressive action thriller. The movie touches on disturbing notions in a post-Sept. 11 world, raising questions about when violence is justified and examining definitions of freedom-fighting vs. terrorism. "Here we have a movie about a guy who wears a mask the whole picture, with controversial subjects, some hot-button issues. Not the standard-fare movie, and we did a strong opening and attracted a huge amount of people," producer Silver said. "V for Vendetta," $26.1 million. "Failure to Launch," $15.8 million. "The Shaggy Dog," $13.6 million. "She's the Man," $11 million. "The Hills Have Eyes," $8.1 million. "Tyler Perry's Madea's Family Reunion," $3 million. "The Pink Panther," $2.5 million.